Why Obama has the power to stop millions of deportations without Congress. That shift in immigration policy is well within the limits of presidential power. 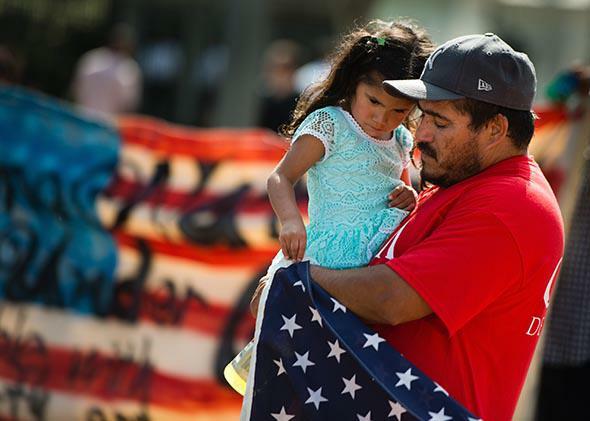 Istella Oros, 3, of Richmond, Virginia, was born in the United States, but both of her parents, including her father, Francisco Oros, 42, are undocumented. Oros is originally from Mexico. They are one of the many families facing the risk of separation by deportation. The White House has reportedly hatched a plan to allow as many as millions of undocumented immigrants who are relatives of U.S. citizens to remain in the United States and obtain work. This plan, if put into effect, would extend President Obama’s earlier order deferring legal action against “DREAMers”— immigrants who arrived in this country illegally as children. The new plan has revived accusations that Obama is acting lawlessly by putting into effect laws that Congress has considered and rejected. Ross Douthat, writing in the New York Times, scolded about “domestic Caesarism,” a reference to the famous Roman who launched a civil war, organized a religious cult around himself, and founded a dictatorship. This accusation is based on a misunderstanding of the law and our constitutional system, which gives the president the power of the executive. This power gives the president—and other executive officials like governors and mayors—discretion to choose which laws to enforce and which laws not to enforce. Yes, there are broad limits. For example, executives may not favor or disfavor ethnic or racial groups, which would violate the Constitution’s guarantee of equal protection under the law. But in essence, when Congress gives the president money to go after lawbreakers, it’s understood that the president must set priorities. There is never enough money to investigate, catch, and try all the people who have broken any given law. Discretion is built into the system. All of this goes double for immigration law. The president’s authority over this arena is even greater than his authority over other areas of the law. For decades, presidents of both parties have deferred legal action against millions of people who entered the country unlawfully. As the immigration law experts Adam Cox of New York University School of Law and Cristina Rodriguez of Yale Law School have described in a paper, this has been going on at least since the 1940s. In that decade, Presidents Franklin Roosevelt and Harry Truman created a guest worker system, called the Bracero program, for Mexican agricultural workers. After Roosevelt started Bracero, Congress authorized it for a short time. When that period ended and the law expired, President Truman kept the program going. In the 1970s and 1980s, thousands of Cuban and Haitian migrants washed ashore in Florida. Various presidents allowed them to remain in this country and obtain work despite their illegal status. Douthat argues that selective enforcement of the law amounts to “de facto repeal.” I don’t know what this means. Selective enforcement of jaywalking laws hasn’t resulted in their repeal. They are still on the books, and the police can decide to enforce them if they want to. In response to a piece I wrote for the New Republic criticizing Douthat’s arguments, Reihan Salam, writing in the National Review Online, claimed that the president must use the resources that Congress gives him in order to advance Congress’ intent. We know that Congress doesn’t want the president to stop deportation proceedings because it has voted down bills that would offer paths to citizenship. But there is no such principle in American law. Because Congress passes more laws than can be enforced, while giving the executive branch (necessarily) limited resources to enforce them, the president has no choice but to defy Congress’ intent. At least, if you imagine that Congress really wants all those laws enforced to the hilt, which is not really true. Salam also thinks that there is something wrong with announcing in advance that the government isn’t planning to enforce the law against certain people. Cities do not announce that they will not enforce jaywalking laws; they just don’t do it. Salam thinks that Obama is crossing a line by declaring that he won’t enforce all the immigration laws rather than (like President George W. Bush) allowing illegal immigrants to work and stay in the country without saying so. This argument is wrong. While it is unusual for officials to announce in advance that certain laws will not be enforced, it happens. Some cities, for example, have announced that they will not enforce laws against possession of marijuana under certain conditions. The Brooklyn district attorney made just such an announcement last month. It is better for people to know the government’s enforcement priorities so that they can plan their lives around them, than to be forced to guess (or to pay high fees to lawyers for the information). Obama’s reportedly proposed action would advance the rule of law over the Bush (and pre-Bush) baseline of silent nonenforcement. Last week, Salam argued in Slate that another problem with the president’s immigration plan is that its justification is congressional intransigence. The president has said that he must act because Congress has failed to act. But “gridlock is good,” says Salam. Congress is implementing the will of the people by not doing anything at all. Salam gets his argument backward. He wants the president to take account of Congress’ stalemate. But Congress’ decision not to act is just that—it’s not a new law. Thus, the president has properly relied on existing law, which takes us back, once again, to his authority to deport, not deport, or do anything in between. Obama can’t infer anything from Congress’ failure to act. The noisy complaints of a bunch of House Republicans possess no legal status whatsoever.